Energy Conservation: Conservation of Energy is one of the primary areas of concern for Bidhannagar College. Efforts are made to increase the usage of alternate and renewable sources of energy as well as recycling of available natural sources for usable purposes. The following measures are taken within the institution’s premises to curtail wastage of energy and maintain optimum conservation. Sustenance of nature is the key concern for the institution in this regard. 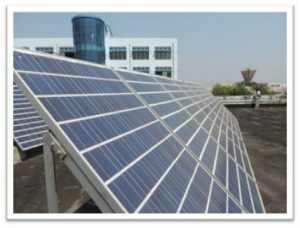 Solar Energy: Conservation of solar energy is practiced within the college campus. The principal and his office as well as all the departments of the college has one electric point (either light or fan) with the solar energy plant which is installed in the terrace of the college. 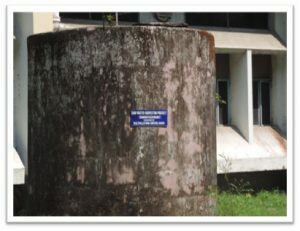 Water Harvesting: Bidhannagar College (with the initiative of the Department of Botany) has constructed rain water harvesting infrastructure which provides supply of water for the purpose of cleaning and gardening in the institution. Giving more importance in the greenery and plantation program within the college promise for more supply of oxygen and reduction of gaseous form of carbon. The institution boasts of a vast stretch of open land. With no big scale factory in the vicinity, carbon pollution level is generally low. The personal vehicles used by the staff members conform to state defined pollution rules and matches with Euro III and Euro IV specifications to reduce carbon emission. Installation of low energy lights in the new infrastructure has been done within the campus. 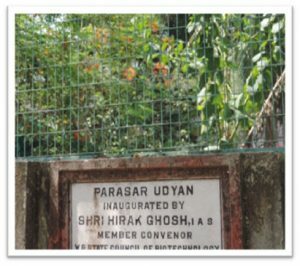 – ‘Parasar Udyan’ maintained by the Department of Botany which is not only integral to the study of the UG syllabus but also an important instrument for environment consciousness. Chemical wastes including radioactive compounds are disposed off by the Chemistry department. Some kinds of chemical wastes are disposed off in sealed container. Disposal of pathogenic bacteria by Microbiology department. The micro-organisms used and grown in different media for teaching and research purposes are sterilized after use by autoclaving. It is done by the students after class and also by the laboratory assistants. The institution being a government body, P.W.D (electricals) looks after the e-related management and wastes. Nature Club: “Prakriti Porichoy” under the aegis of WWF was initiated from the year 2013.